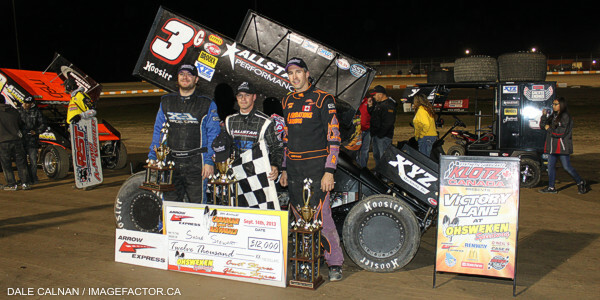 by Tommy Goudge (September 14, 2013) – Shane Stewart of Bixby, Oklahoma became the 2nd driver in as many years to win his 3rd career Canadian Sprint Car Nationals feature in the 9th annual edition of Ohsweken Speedway’s signature event on Saturday night. Stewart led 34 of 35 laps in the feature to earn the $12,000 prize, while fellow 3-time Nationals winner Steve Poirier settled for second, and Jason Barney charged through the field to take third. Karl Sault claimed the feature win in the companion Affordable Towing & Recovery Thunder Stocks event. The front row for the 35 lap A-Feature was star-studded, with 3-time CSCN winner Steve Poirier on the pole, and 2-time winner Shane Stewart next to him. Poirier and Stewart diced for the lead in turns 1 and 2 when the green flag was thrown, but the race was quickly red-flagged before a lap was completed when Yan Bilodeau got upside down in turn 1. 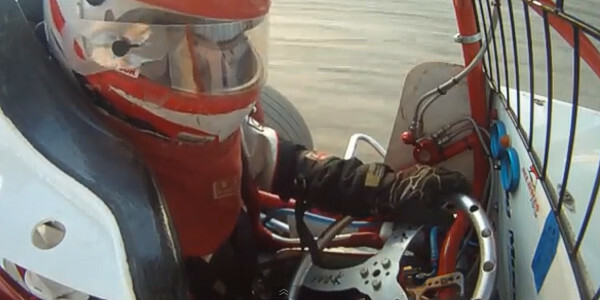 The young driver climbed from his car without issue, but was unable to restart. The second try at starting the race was better, and Poirier led the first lap before Stewart took command. It didn’t take Stewart and Poirier long to get into traffic, and start putting laps on drivers running at the back of the field. Wayne Johnson was one of several drivers to keep an eye on early in the race. The 2008 CSCN winner started 8th, and moved into the top 5 by lap 4, while First-time Ohsweken competitor Brooke Tatnell followed Johnson forward. Johnson moved past Mikey Kruchka and into 4th on lap 11, but disaster struck on lap 13 when Poirier moved up the track exiting turn 4, triggering a chain reaction incident with Dylan Swiernik which eventually collected Johnson and Kruchka in a vicious crash entering turn 1. Poirier and Swiernik continued on, while Johnson’s damaged car slid down the track and was hit by Kruchka, who ricocheted into the inside wall in turn 1. Fortunately, both drivers were able to walk away from the crash. The race was slowed again on lap 15 when Jamie Collard came to a stop with front end damage exiting turn 4. Stewart had a good restart and led the rest of the race. Behind him, Jason Barney was beginning to move through the pack after starting 11th. He was up to the top 5 with 15 laps to go, and got past Dylan Swiernik for 3rd place with 9 laps left. Stewart went on to win the race, but battled though a flat left front tire over the last 2 laps. Poirier fought off Barney for the runner-up spot, while Swiernik and Randy Hannagan rounded out the top 5. Chuck Hebing advanced from row 10 to finish 6th, followed by first time Ohsweken visitors Brooke Tatnell and Brad Loyet, then Robbie Stillwaggon the final car on the lead lap, and Bryan Howland 10th from row 9. 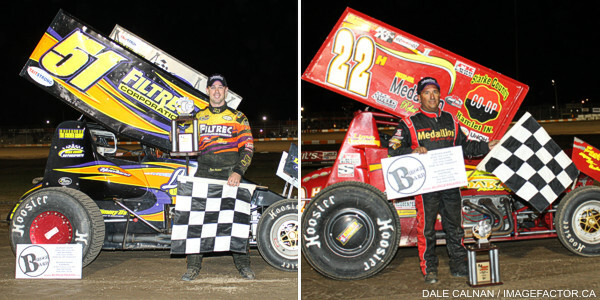 65 drivers from 2 Canadian provinces, 10 American states, Australia, and New Zealand attempted to qualify for the 2013 edition of the Nationals on Saturday night. Randy Hannagan ran the fastest time overall in group time trials to collect the Top Qualifier Award, while Mikey Kruchka claimed the Top Canadian Qualifier award. Don Adamczyk and his crew were awarded the Corr/Pak Merchandising “Bill Peer Memorial” Best Appearing Car honours. Heat races went to Steve Poirier, Shane Stewart, Robbie Stillwaggon, Mikey Kruchka, Dylan Swiernik, and Alain Bergeron, while the B-Mains were claimed by Justin Barger, Chuck Hebing, and Jim Huppunen, and Tom Huppunen won the Little Feature. Ohsweken Speedway wishes to thank all of the sponsors responsible for making this weekend’s event a big success, including Arrow Express, Corr/Pak Merchandising Inc., Renway Fuels & Lubricants Heating & Cooling, O’Neil’s Farm Equipment, McDonald’s Restaurants of Paris & Brantford, Nathan Ackland State Farm Insurance, Klotz Canada Synthentic Lubricants, Burger Barn, Affordable Towing & Recovery, HRW Automotive, and Gale’s Auto Aftermarket. Lee Winger and Karl Sault started the final Thunder Stock feature of 2013 on the front row, and Sault led from the drop of the green flag, with Winger giving chase. Dave Silverthorn, Jr. eventually entered the fray, but neither he or Winger could catch Sault on this night. Karl survived several restarts and cruised to the win, followed by Winger, Mike Thorne, and Ryan Beagle. Heat races for the 25 car field were claimed by Mike Thorne, Lee Winger, and Dave Bailey, while Karl Sault set a track record in the first ever time trial session for Thunder Stocks held at Ohsweken at 20.063 seconds. 1. 28fm Steve Poirier (2), 2. 7x Jamie Collard (3), 3. 52x Scott Kreutter (4), 4. 33k Kyle Patrick (5), 5. 80 Chris Steele (7), 6. 0 Glenn Styres (6), 7. 67 Chris Durand (11), 8. 67x Gord Bennett (10), DNF. 5d Dave Dykstra (1), DNF. 43 Scott Sherk (9), DNF. 00 Ryan Grubaugh (8). No Time. 1. 3g Shane Stewart (3), 2. 77x Wayne Johnson (2), 3. 2m Dustin Daggett (4), 4. 5b Justin Barger (6), 5. 19k Paul Kinney (1), 6. 10c Jeff Cook (8), 7. 16 Ryan Ruhl (5), 8. 07x Dain Naida (7), 9. 31 John Burbridge, Jr. (9), DNF. 15 Mike Ferrell (10), DNS. 10 Mitch Brown (11). No Time. 1. 89 Robbie Stillwaggon (1), 2. 22h Randy Hannagan (4), 3. 35 Jared Zimbardi (2), 4. 45 Chuck Hebing (7), 5. 53 Shawn Donath (8), 6. 49 Todd Hoddick (3), 7. 27h Tom Huppunen (5), 8. 3r Shane Ross (6), 9. 52 Jesse Costa (10), 10. 9nz Havard Daniels (9), 11. 70 Jim Lingar (11). Time – 2:17.933. 1. 01k Mikey Kruchka (4), 2. 19 Brooke Tatnell (5), 3. 123 Yan Bilodeau (2), 4. 55 Patrick Vigneault (11), 5. 7m Justin Martin (10), 6. 98 Joe Trenca (1), 7. 94z Stan Zanchin (6), 8. 15aw April Wilson (8), 9. 23 Joe Geibe (9), DNF. 11 Jamie Turner (3), DNF. 49d Shawn Dancer (7). No Time. 1. 7c Dylan Swiernik (1), 2. 87 Jason Barney (4), 3. 42w Rick Wilson (2), 4. 67c Steve Collins (8), 5. 14h Jim Huppunen (6), 6. 17j Lance Yonge (5), 7. 5m Brad Malloy (9), 8. 1z Jessica Zemken (7), 9. 38 Brad Knab (3), 10. 21 Don Adamczyk (10), 11. 5c Conor Mahoney (11). Time – 2:22.835. 1. 8b Alain Bergeron (1), 2. o5 Brad Loyet (3), 3. 51 Bryan Howland (2), 4. 13 Kevin Ward, Jr. (4), 5. 422 Etienne Girard (8), 6. 17 Jared Horstman (5), 7. 84 Tyler Rand (7), 8. 5 Keith Dempster (6), 9. 30g Steve Goldner (9), 10. 21j John Burbridge, Jr. (10). Time – 2:21.570. 1. 5b Justin Barger (2), 2. 10c Jeff Cook (6), 3. 16 Ryan Ruhl (8), 4. 33k Kyle Patrick (1), 5. 80 Chris Steele (3), 6. 07x Dain Naida (10), 7. 0 Glenn Styres (5), 8. 67x Gord Bennett (9), 9. 67 Chris Durand (7), DNF. 19k Paul Kinney (4), DNF. 31 John Burbridge, Jr. (12), DNS. 5d Dave Dykstra (11), DNS. 43 Scott Sherk (13), DNS. 15 Mike Ferrell (14), DNS. 00 Ryan Grubaugh (15), DNS. 10 Mitch Brown (16). No Time. 1. 45 Chuck Hebing (1), 2. 53 Shawn Donath (3), 3. 27h Tom Huppunen (7), 4. 55 Patrick Vigneault (2), 5. 7m Justin Martin (4), 6. 49 Todd Hoddick (5), 7. 52 Jesse Costa (11), 8. 49d Shawn Dancer (16), 9. 11 Jamie Turner (14), 10. 98 Joe Trenca (6), 11. 9nz Havard Daniels (13), 12. 94z Stan Zanchin (8), 13. 3r Shane Ross (9), DNF. 15aw April Wilson (10), DNF. 23 Joe Geibe (12), DNF. 70 Jim Lingar (15). Time – :..
1. 14h Jim Huppunen (3), 2. 13 Kevin Ward, Jr. (2), 3. 67c Steve Collins (1), 4. 5m Brad Malloy (7), 5. 17 Jared Horstman (6), 6. 1z Jessica Zemken (9), 7. 5 Keith Dempster (10), 8. 21 Don Adamczyk (13), 9. 30g Steve Goldner (12), 10. 17j Lance Yonge (5), 11. 84 Tyler Rand (8), 12. 5c Conor Mahoney (15), 13. 21j John Burbridge, Sr. (14), 14. 38 Brad Knab (11), DNS. 422 Etienne Girard (4). Time – 3:03.741. 1. 28fm Steve Poirier (3), 2. 3g Shane Stewart (1), 3. 7c Dylan Swiernik (4), 4. 8b Alain Bergeron (5), 5. 01k Mikey Kruchka (2), 6. 89 Robbie Stillwaggon (6). Time – 0:58.162. 1. 27h Tom Huppunen (2), 2. 17 Jared Horstman (6), 3. 16 Ryan Ruhl (1), 4. 67c Steve Collins (3), 5. 33k Kyle Patrick (4), 6. 1z Jessica Zemken (9), 7. 07x Dain Naida (10), 8. 7m Justin Martin (8), 9. 5 Keith Dempster (12), 10. 49 Todd Hoddick (11), 11. 55 Patrick Vigneault (5), 12. 52 Jesse Costa (14), 13. 30g Steve Goldner (15), DNF. 0 Glenn Styres (13), DNF. 80 Chris Steele (7). No Time. 1. 55 Mike Thorne (4), 2. 85b Ryan Dinning (3), 3. 44 Kevin Dawson (6), 4. 10 Jake Brown (2), 5. 119 Shaun Quinn (7), 6. 93 Melissa Miller (1), 7. 911x Terry Martin (8), DNF. 5d Dylan Peckham (5). Time – 2:42.753. 1. 2 Lee Winger (3), 2. 9 Dave Silverthorn, Jr. (4), 3. 84rk Ryan Beagle (1), 4. 04x Jay Liverance (2), 5. 33 Jack Myers (9), 6. 00 Robbie General (8), 7. 4 Dale Gyokery (7), 8. 17 Rob Disher (5), DNF. 52 Tony Fraser (6). No Time. 1. 31 Dave Bailey (3), 2. 81 Karl Sault (4), 3. 711 Paul Reichel (5), 4. 911w Wyatt Van Wart (6), 5. 38 Derek Miller (1), 6. 777x Chase Hess (8), 7. 23 Trevor DeBoer (2), 8. 00xw Craig White (7). Time – 2:42.557.